Does Russia fit into the U.S.-Vietnam equation? Last week, General Secretary of the Communist Party of Vietnam Nguyen Phu Trong completed a five-day visit to the United States, meeting U.S. President Barack Obama, a move widely considered a landmark in what is becoming one of the most intriguing bilateral relationships in the Asia-Pacific. Unlike Xi Jinping, the Vietnamese leader does not hold any official position within the government, which formally makes him a representative of nothing more than a political party, though it is clear that he is among the few who effectively run the country. Given the CPV’s monopoly on power, accepting this difference in the political structures of the two states is a significant gesture by the White House, one that demonstrates a willingness to go beyond ideology in the interest-driven environment of contemporary world politics. When speaking about burgeoning U.S.-Vietnam relations, China is always the elephant in the room. The dynamism of bilateral ties is to a great extent determined by Beijing’s mode of operation in the Asia-Pacific. Both Hanoi and Washington can reiterate statements about their ties being a good in themselves, and indeed they probably are, but one can’t ignore Vietnam’s central role in U.S. regional strategy aimed at accommodating and managing China’s growing influence. In a similar fashion, relations with the U.S. are crucial for Vietnamese foreign policy as a hedge against excessive dependence on China. While China is never missed in any U.S.-Vietnam relations analysis, Russia is often omitted (to the disappointment of Asia-watchers in Russia). This isn’t exactly fair, because as Hanoi and Washington may be moving to an “extensive” and “comprehensive” partnership, it is still not “strategic” – a characteristic that has special importance attached to it by diplomats in Russia and, more importantly, Vietnam. Given the current tension in U.S.-Russia relations, what is Moscow’s position in this complex Asian game? 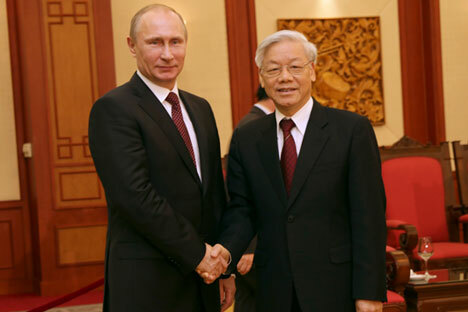 “Traditional” is another popular adjective in contemporary Vietnam-Russia rhetoric. It has little to do with the pragmatic foreign policy pursued by the Vietnamese leadership, so perhaps it would be more useful to think about Russia’s place in Hanoi’s priority list in simpler terms. What is it that Russia can do for Vietnam that the U.S. cannot? The first thing that comes to mind is arms trade. Russia has been a supplier of military equipment to Vietnam since the war and continues to be the main source of the country’s naval modernization. At the core of this relationship is the six Kilo-class submarine contract complemented by Klub surface-to-surface missiles. Though lifting the embargo will enable the U.S. to sell (or give) the Vietnamese military equipment for the Coast Guard and Navy – and we can see this happening already – it is clear that it would take Vietnam decades to readjust completely to new hardware. So Russia is likely to remain the key arms trade partner amid tensions in the South China Sea, which are unlikely to be resolved in the observable future. The article is abridged. Read the full version at Asia.RBTH.ru.